Perhaps for the first time ever, Rio’s urban planning inteligentsia came together in public, last Monday, for an OsteRio debate, “A city in transformation: urban interventions in Rio de Janeiro”. There was quite a bit of consensus among the specialists. Mobility. Three of the four BRTs connect with Barra. Nothing has been done to revitalize existing suburban train lines. Rio’s transportation model is linear, when it should be nodal, with interlinking networks. Morar carioca. The program to upgrade all favelas by 2020 seems to be stuck on the drawing board. Avenida Rio Branco. There’s been no debate on the decision to close Cinelândia to traffic and make it a pedestrian area. It could turn into an empty zone, with a loss of historic character. Too much focus on Barra. This could cause an impoverishment of other neighborhoods, particularly in the North Zone, in terms of both investment and population. To lower the cost of urban services and those of the private sector as well , cities worldwide today value density; Rio seems to be doing the opposite. Lack of an aesthetic vision for the Port area. Commercial interests seem to predominate, in decisions about what the revitalized region will come to look like. Lack of metroplitan vision. It’s time for Rio to join with neighboring cities for the planning and execution of many public policies. (In fact, a new group, the Casa Fluminense, came together this year under this banner, and is working on a metropolitan agenda for 2017. At the end of May, the Casa organized a day focused on the metropolis, which included an extremely useful presentation by economist Mauro Osório). Lack of dialogue. With a barely autonomous City Council that hardly represents citizens’ concerns, a press that provides sketchy coverage of city issues and an authoritarian mayor, what remains is the Ministério Público, or public prosecutor’s office — weakened by the omissions of the other actors. Washington Fajardo, planner and architect, the young president of the city’s Rio World Heritage Institute, found himself somewhat isolated, even as he shared the microphone with Luís Fernando Janot and Flávio Ferreira, both urban planners with long careers. In the audience was another experienced planner, Sérgio Magalhães, president of the Rio chapter of the Institute of Brazilian Architects. Fajardo noted that the city is in fact investing in the North Zone, with the Bairro Maravilha program, the Madureira Park, and the long-dreamed-of drainage of the Praça da Bandeira. He said that mobility will change radically in Rio in the next few years. And he assured his listeners that the Morar Carioca program will indeed happen, with its 2020 “goal maintained”, and the bidding process about to take place. 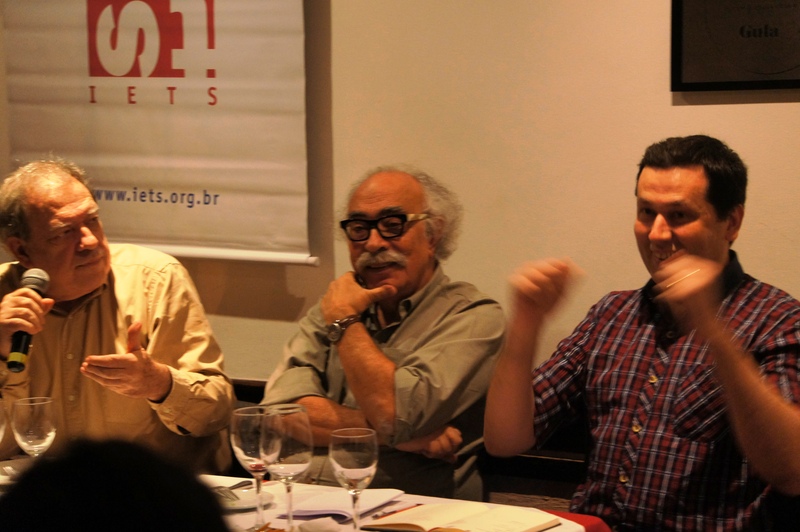 Sérgio Magalhães and Luís Fernando Janot, who write regular columns in O Globo, often publish their ideas (Magalhães in fact may be the first to have suggested, to a large audience, an alternative to the construction of low-income housing). But, aside from their articles and O Globo’s extensive coverage of the controversies over the Y-shaped pier and land-use issues in the Botanical Gardens, the exchange that occurred at the OsteRio is a rarity. The night’s debate also included lay critics, who complained more than they praised, lamenting a gamut of municipal practices, from the exaggerated abundance of newsstands in the Zona Sul, to the obsolete beachfront kiosk project in Copacabana, which fails to take into account changes in urban thinking and in the environment as well. The issues raised at the OsteRio came from specialists who have experience in developing and implementing public policy. Still, with so much change in progress, it must be hard even for them to imagine what it will be to live and work in Rio de Janeiro five years from now. It’s easy to criticize, from outside the circles of power. Notably, Fajardo said he’s begun to play a new role, that of interlocutor between the Paes administration and society at large. “City hall has never avoided participating in debate and has never shied away from reviewing plans and actions,” he said. Hopefully the exchange begun last Monday will continue, with some degree of intensity. This entry was posted in Brazil, Transformation of Rio de Janeiro / Transformação do Rio de Janeiro and tagged Flávio Ferreira, Luiz Fernando Janot, Morar Carioca, OsteRio, Rio de Janeiro city planners, Rio de Janeiro city planning, Sérgio Magalhães, Washington Fajardo. Bookmark the permalink.